A balanced diet is an essential factor to maintaining the health and well-being of your dogs. This is in line with the old adage that too much of everything is bad. However, this is not necessarily always the case. Fiber being one among certain cases is a nutrient that when served in a high amount can give your dogs a variety of benefits. These include having a very healthy digestive system which in turn will improve your dog’s immune system among all others. With that being said, I crafted a guide that includes my top five picks, that you can turn to when buying a high-fiber dog food. Are You Hesitant to Buy High-fiber Dog Food? What are some Additional Ways to Give your Dog Fiber﻿﻿﻿﻿? ​What are the Factors I have to Consider before Buying? 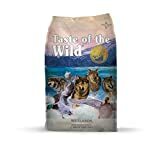 This dog food product mostly gathers its protein source from a variety of fish such herring, salmon, and whitefish which is another good thing, most especially for those dogs that are allergic to chicken. This aides in a leaner direction of muscle growth among your dogs that also serves as a protection against unhealthy weight gain. Mixed with these protein sources are vitamins gathered from vegetables and fruits like spinach and cranberries. Another thing I loved about this is its antioxidants and fiber sources are gathered from plants which is an all-natural method. This immediately became one of my top picks once I realized how helpful this is when it comes to preventing further weight gain among my dogs. It is able to maintain my dog’s current weight most especially since it also promotes the lean type of growth in muscles. It gathers its protein content from a diverse pool of food sources such as real salmon and chicken. Moreover, its formula is grain-free and contains substances that help promote healthy coat. Its fiber sources are derived from a variety of vitamins, antioxidants, and minerals. Just like us people, some dogs have their own preferences. One of my dogs is a picky eater but absolutely loves this product. This dog food comes with a diverse collection of flavors. And even if your dog is not a picky eater, this certainly is an added treat for him or her. Moreover, in terms of fiber content, it is loaded with numerous antioxidants and even natural substances such as sweet potatoes, vegetables, and fruits. 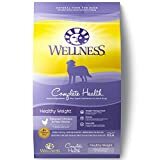 I consider this one of my top favorite picks because with its amount of fiber, this dog food brand helps balance my dog’s weight. It contains 20% less fat and 15% less calories than its predecessor Instinct Raw Boost Chicken Meal Formula. Moreover, this dog food also contains a formula that is grain-free and gluten-free. For some who may be unaware, grains are bad for your dog for they may make your dog’s stomach upset. I guess, if there’s one thing I was quite hesitant about this was the fact that it its central source of animal protein is meat. That can pose a problem for dogs that are allergic to chickens. This dog food product gathers its fiber sources from premium ones such as ground barley and brown rice. In addition, it also gathers it from vegetables like carrots and sweet potatoes. Moreover, this dog food brand contains many other ingredients and substances that promote the health of your dog. One being lactobacillus. This element helps to ensure that your dog’s digestive system will remain smooth. Another element is chondroitin which aids in achy bones among mid to large sized dogs. If your answer is yes, then allow me to list down all the benefits you can get from having a high-fiber diet plan or dog food. The main benefit that the nutrient fiber provides is for the digestive system. Just like us human beings, dogs also suffer from digestive related complications such as bloating, irregular bowel movement, and constipation among a variety of others. With the help of fiber, all these can be prevented and avoided. Problems and complications such as bowel movement can sometimes seem like a minor problem but when it comes to our little furry friends, this is never the case. Since grains and the likes are the usual filler in dog food, it can gas up and fill up your dog’s stomach and cause complications. With a high fiber diet, this can be avoided because of the insoluble and dietary fiber which goes through their system the same way they came in. Obesity is something that can be difficult to prevent most especially when your dog is highly active and has a huge appetite. However, with a high-fiber food, instances like this can be controlled. Fiber is a magical nutrient in a sense that once it enters your dog’s digestive, it absorbs all the water in his body and automatically expands. Fiber mainly helps prevents problems that concern the digestive system, however, there are other conditions in which fiber also helps to avoid. One example is diabetes. When your dog takes food rich in fiber, the possibility of unexpected crashes or spikes in the level of blood sugar is prevented. Cancer or to be specific, colon cancer in dogs occurs when cancer cells are formed. Fiber, however, fights to stop cancerous cells from being born in your dog’s system. Given that fiber helps to prevent numerous health complications such as diabetes and bloating, it can be concluded that fiber helps in improve their immune system. With a stabilized blood sugar level and a regular bowel movement, dogs are proven to be at a healthier state. What are some Additional Ways to Give your Dog Fiber? Now, that we have tackled the benefits of giving your dog a diet plan that is rich in fiber; let’s move onto some more ways that we can add fiber to his or her diet. These ways are also helpful for the transitional stage in which you have to slowly introduce more fiber to his diet to prevent him or her from getting overwhelmed. Giving your dog sweet potato is good and a natural way to introduce fiber to his or her diet. It comes straight from your own kitchen which reassures that you that the food you are f﻿eeding to your dog is not just healthy, but clean, as well. I recommend Glandex, a fiber supplement that derives its content from all natural ingredients. While a high content of fiber in your dog’s diet is an absolute good thing, of course it still comes with a limit. Allow me to tackle some of the factors you have to consider before buying a dog food with high fiber content. First, evaluate the dog food brand you have previously used and fed to your dog. If it has a relatively smaller fiber content in comparison with the product you purchase, then you might consider going for the slow introduction of fiber approach to your dog. This is because sudden introduction of a high content and amount of fiber in your dog’s diet may cause a shock in is system and lead to health complications. An example of this one would be diarrhea. If you make sudden shift to a high fiber diet, your dog’s feces may turn loose. For this reason, it is essential that you give your dog ample time for adjustment. Do this by only gradually increasing the amount of the dog food with a high fiber content before serving them in full or the normal amount. Another thing you have to do is talk to your veterinarian before doing anything else. Of course, doing your own research must always be done but getting a feedback and advice from your dog’s own doctor is a must, as well. Each dog’s fiber or nutrient needs varies from one dog to another. For this reason, you have to know what exactly is the recommended amount that your dog needs. Overdosing in this amount can cause a disturbance in the absorption of nutrients in your body. Third, you have to know how vulnerable your dog is to conditions such as obesity and how sensitive his or her stomach is. All these factors help you conclude how much fiber he or she needs. All brands and products in the roundup have relative high content of fiber however only one comes out on top. That brand is Earthborn Grain Free Coastal Dry Dog Food. I chose this as my top pick for a number of reasons. First, I love that I can feed it to all my dogs and not worry about who has the chicken allergy or not. Since its protein source is gathered from fish, this does not pose any problem to me. I also loved that it promotes lean type of muscle growth and helps maintain my dog’s weight. Third, its formula is balanced with vegetables and minerals. Lastly, its fiber content is derived from natural plant sources.